So, now I am a history teacher. Therefore, really I am a storyteller. My audience really needs to understand setting to grapple with the narrative. So geography is our lens to meet the history waiting to be studied. But also geography will be our lens to current events. This week: the Bible Belt. Our Question today: What is religious freedom and what does the freedom allow Americans to do? Their answers are general and unsure. Doesn’t it mean that anyone can believe anything? Yeah, sure. What else? A Muslim can be a Muslim and a Christian can be a Christian. Right on. What else? Nothing more? That’s a good start. I tell them that most of the class got the question about the Bible Belt wrong on this week’s quiz. All they had to know was a general location of this imaginary place and a few words of what it may mean. We had gone over this, but it didn’t land. No worries, class. Maybe it will today. Perhaps to understand the Bible Belt we should look at current events. We should look at Kentucky. Kentucky is a beautiful state. Horse country. Bourbon Trail. Lexington and Louisville. Kentucky is in the news. I make sure my students remember what Kentucky looks like. Something important happened this week in eastern Kentucky. I don’t tell them outright what happened. Straining their short term memory, they are fairly certain they heard something happened there this week. But they don’t know. Basically, too many of them are unaware this is the shape of Kentucky. This is a class of 21 Juniors and 12 Seniors. All of them will be able to vote in the next election. So I show them this map. One students knows exactly what the colors mean. This is the visual representation of how Obama won the election in 2012. Obama is blue. Romney is red. 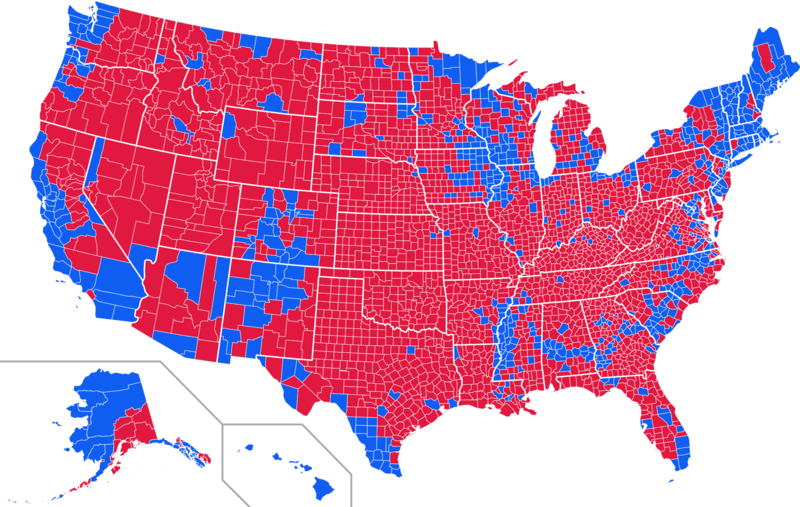 Well how did Obama win if most of the map is red? I respond by asking them which states are mostly red, if not completely red. Oklahoma is completely red. Same with Utah. Have you ever been to those places? Ever driven through them? 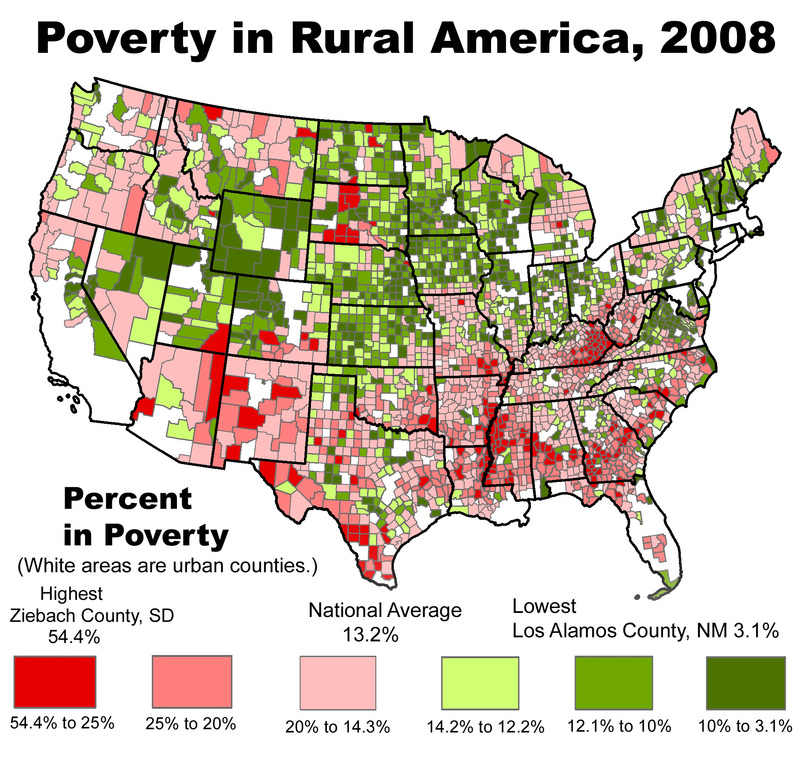 Are people densely populated like New York City or rural like northern New Mexico? Rural. So it all depends on how many people live within those tiny demarcations. Especially on a Friday, tangents are a student’s best friend. I wanna talk about Trump! Perfect, let’s do that. What’s the only platform Trump is running on? He hates Mexicans. It sure sounds like it, huh? Do you know his platform besides that? Like his general idea about how to appeal to people in this country? No? Make America Great Again. I assert, with the help of the website, that this is all Trump is saying. Otherwise, he is simply a skillful manipulator of the media. And seriously skillful manipulator/opportunist of the current situation in the US. He is summing up something critical for many people in this country. People feel like America is not so great. There are too many people out of work. There are too many rich people not sharing their wealth. But there are also too many people unwilling to work their way toward the American dream. Too many freeloaders. Basically there are a lot of economic scapegoats. The rich aren’t doing enough of this and the poor aren’t doing enough of that. Another reason why America is not so great. The morality of American is going to hell. Abortion. Gay Marriage. Non-believers are ruining culture, politics, and now these problems are compromising religious freedoms. Something needs to change. Trump, but mostly other Republican candidates, is talking to these people. So eastern Kentucky is rural, poor and votes Republican. We talk about how when a politician like Trump says something so vague it is hard to discern who he is talking to. Because the people in eastern Kentucky are very much unlike those people in the blue counties between MS, AR, LA. Is Trump talking to the people in rural KY? Rural MS? Is he talking to you, in Taos? This receives a universal head shake. So if America is not great anymore. And it’s unclear that our politicians can help us. And it’s pretty clear that voting is usually along party lines meaning entire areas of the country are never dramatic on election nights. People need to take matters into their own hands. Remember: What does our religious freedom allow us to do? Isn’t Kim Davis just trying to make America great again? I give a brief background on the reason why she was in jail. I don’t say my stance on gay marriage, but we live in a blue area and the tone of the room is already wary of why I would show a video of Ms. Davis’ release from county jail. I explain who Mike Huckabee is and how he needs to appeal to voters in the Bible Belt if he is going to beat someone as powerful as Trump. He needs to get behind someone like Kim Davis. Because, in America, the dominant shape of Christianity sees gay marriage as immoral. And to this shape of Christianity, in America, immorality is a political issue. Mike Huckabee, as he campaigns, will look to the Bible Belt and say Kim Davis is everything right with this country. Acting on your sense of Christianity is just if you don’t believe the law of the counties/states/country. We watch this video. The students laugh at the idea of using “Eye of the Tiger” for something, in their eyes, so odd. Mike Huckabee ushers Kim Davis to the stage. Kim praises God, thanks those present for their prayers, rallies the faithful to their act with their convictions. I ask them when they look at that video and see the demonstrations, if they see an America they can identify with. They shake their heads. I ask if the people in eastern Kentucky saw a demonstration in northern New Mexico, would they see an America they identify with. They shake again. I know, I’m leading the witness. But this leads us back to the Trump tangent. So, Make America Great Again. Whose America? Is it my America? I’m white. I have a college degree. I might make more money than your parents. Is it your America? Students of color, living below the poverty line, in one of the poorest states in the Union. Is it Kim Davis’? Is it those in the Mississippi Delta, home of the hill country blues? Is it the people in the school district of Normandy? It’s a critical question. What is religious freedom and what does the freedom allow Americans to do? I don’t need to lead my students to answers, but exploring one guiding question begs another. It’s a critical election. What does it mean to be great? Again? For who? I had completely unengaged experiences in high school history classes. I wish I could audit yours! You covered a lot of territory in one class period. I hope your students are thinking about your class between sessions. I would be. Thanks Betty! They were paying close attention. The students are very worried about Trump. In so many cases, many people from Taos do not often affiliate or sympathize with migrants crossing our borders. But his rhetoric is striking a chord with them that is creating a solidarity, or at least putting them on notice. When he says Mexicans, perhaps my youngsters fear he is speaking about them (maybe because he is so dense about other issues, he may not know what a New Mexican is!). Thanks for reading!